You know how each month I get to try out new food, toys and treats as a Chewy Influencer? Well earlier this week we found a Chewy box on our front step, and since we weren't expecting anything from them the contents of the box were quite a mystery. Mommy opened it up and found a bunch of Valentine's Day goodies for HER! 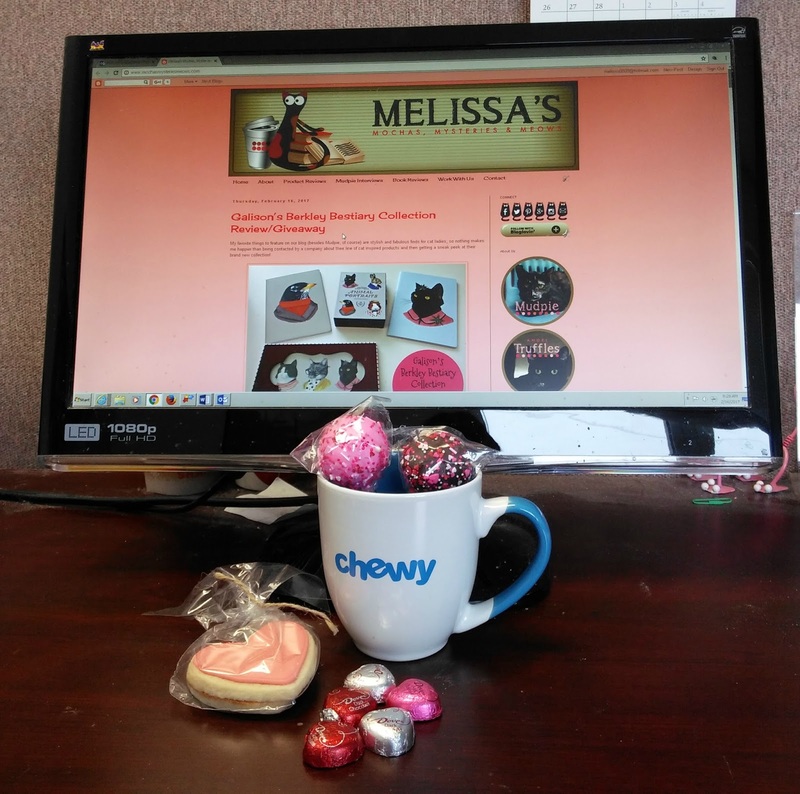 I guess our friends at Chewy know that bloggers run on coffee and chocolate!!! 1. Snow causes a lot of headaches. Don't get me wrong, I love the snow. At Christmas. Which never happens. After miniscule amounts of snow for the past two years, since Sunday we've gotten about a foot and a half of the white stuff that in just a couple weeks will turn into a muddy, wet mess. 2. My favorite kind of soup is Chunky's Chili Mac (at the moment, anyways). 3. When no one is around, I get into mischief. 4. Mommy is my best friend. We hope the chocolate and coffee were fer Mom, and that caused her to get treats fer you! How nice of the Chewy people to acknowledge your human helper, Mudpie! My momma got TWO of those. I guess one for us, and one for da dog blog. Hey, your answer to #4 is the same as Paisley's answer! It's nice of Chewy to look after your mom like that, too. People need chocolate! 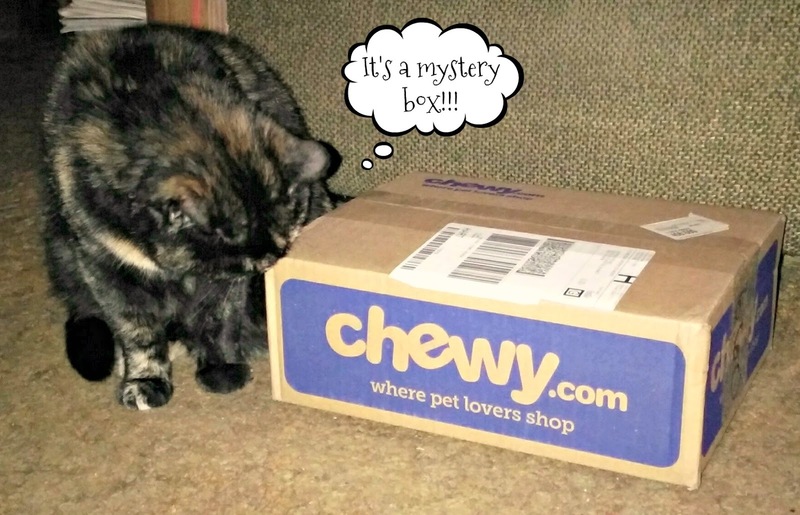 Hooray for Chewy! This is just one of the reasons why I love them so much. They really are great. 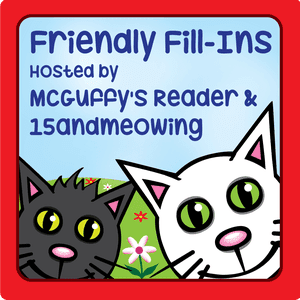 And I love your fill-ins, Mudpie and Melissa! I always hope for snow on Christmas, but it seems we're more likely to get it any day but that. And your answer to #4 is purrfect, Mudpie! Purrs, and happy Friday! Pawsome of Chewy to send Mommy goodies! 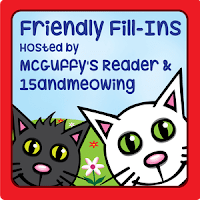 Enjoyed your fill-ins, too. Aww, how sweet of Chewy! Oh, how nice! You are well deserving! Hugs! I need to try that chili mac! But, iyt makes me think of Seinfeld and Beefarino! Well dat was pawsum of Chewy to do fur your mommy. Mommy be jealous. MOL We hate da snow, and know all 'bout dat muddy mess. Stay warm and toasty. Big hugs fur all. None of us here, cats or human, need any treats. We love them lots but we are getting fat. Would be nice though. It was not so nice of Old Man Winter to give you so much snow! over the next few days. Yup, will be messy for us too. Aren't you glad to be an indoor kitty? How sweet of the people at Chewy to send your Mom a little love! We got one of those too....Chewy really is a great company!